Brandy Johnson was a key member of the 1988 US Olympic Team which competed in Seoul . That team placed fourth and Johnson finished tenth in the all-around competition and fifth on vault. The year after the Olympic Games, Johnson won the silver medal on vault at the World Championships, won U. S. National Championships, and the American Cup. Coached by Bela and Martha Karolyi, she was also selected as the “Sportswoman of the Year” in 1989 and was one of ten finalists for the Sullivan Award which is given by the AAU. Johnson retired from gymnastics in 1990. However, she did compete in the World Professional Championships in 1991. She now owns and operates Brandy Johnson’s Brown’s Gymnastics in Florida . 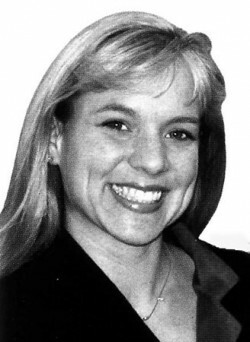 Aside from her gymnastics related accomplishments, Brown has also done work as a commentator for gymnastics broadcasts and she did stunt work for both film and television up until 1996. Johnson has been married to Bill Scharpf, a stuntman since 1993.